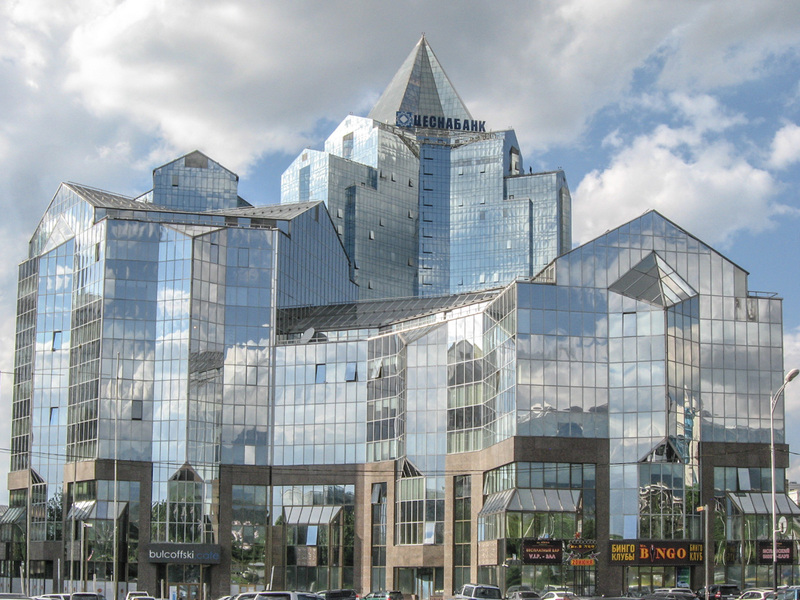 Kazakhstan is the 9th largest country in the world, if that does not mean much to you, dear reader, then I can also inform you with a fact that it is bigger than Western Europe. We, quite inconveniently, were right by the Western edge of Kazakhstan and were aiming for Almaty in the East. With only 29 days left on our Kazakh visa by the time we woke up next to the closest petrol station to the port of Aktau where we had arrived with “Mercuri-1” the night before, we had some 3000 km of the vast, infamous, windy steppe and desert in front of us. Of course, if we had really wanted to test our endurance, we could have tried to attempt the madness of cycling the steppe where the water supply is scarce, the mountains that followed and then some, grinding our teeth against wind all the way to the border of Kyrgyzstan, but we did not ( and I daresay, would not have managed to even if we tried). 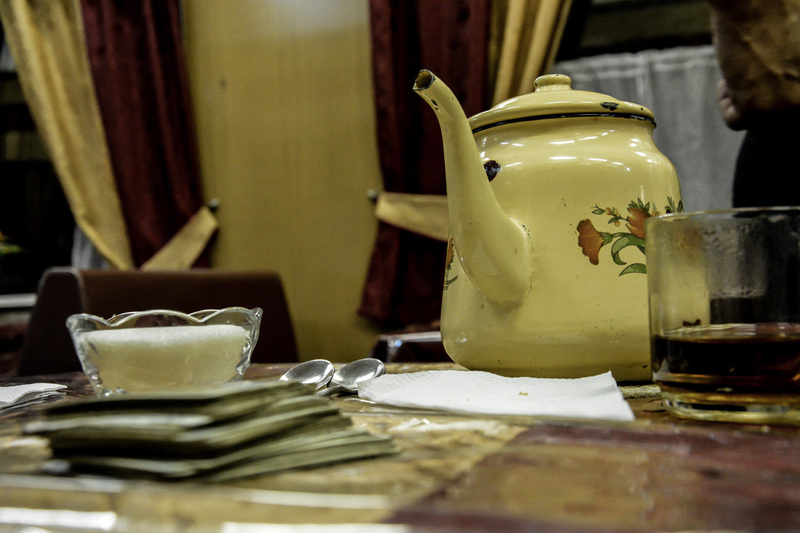 We had already discussed a “way to cheat the West-East problem” and somewhat vaguely researched the routes and prices of the Kazakh train network after first acquiring our visa in Iran. And so it came to be that after spending a couple of days in Aktau at Yuliya’s and Igor’s place (courtesy of the wide network of couchsurfing.com yet again), we only “experienced” less than the ridiculous distance of 20 km of the flat, deserted lands and hopped (or rather tried to) on a train that would take us to “the City of Apples” – Almaty where we hoped to meet up with our friend Duman. 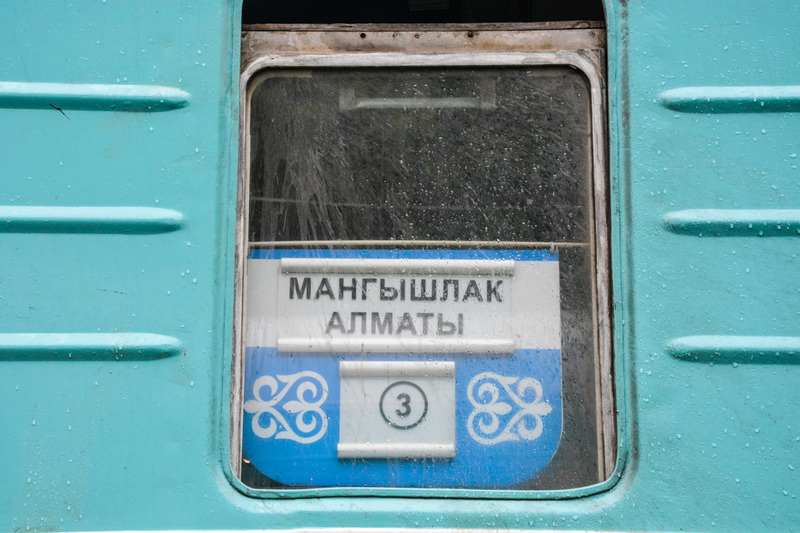 On the platform we were greeted by the train attendant with greedy, sparkling eyes (during the 3 uneventful days and nights we spent on the almost express, we started calling him the BossMan). The BossMan’s money radar was up and ready for a little bribe he intended to receive for taking our bikes on board. Indeed, after checking our tickets he instantly said: “we can work something out” (“мы можем что-нибудь придумать”) even before we had managed to ask him anything regarding the bicycles, no shyness or secrecy, just quite a plain “pay up or go home”. 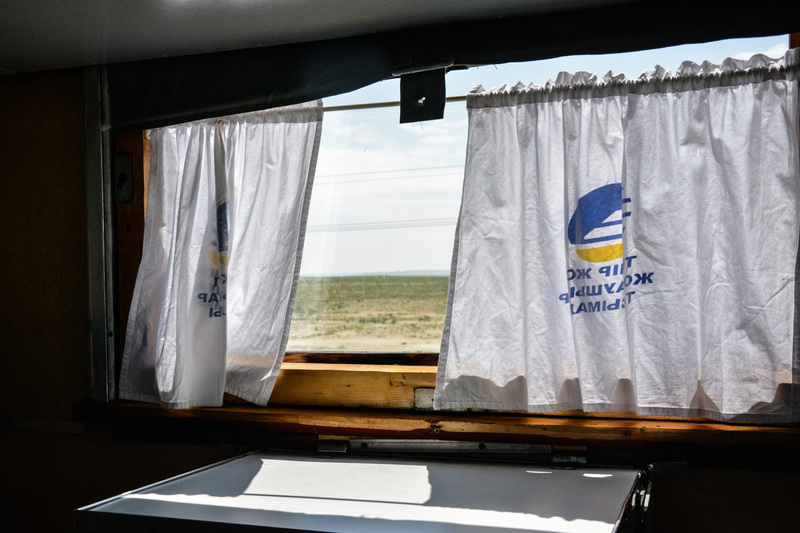 We had read before, that other travellers going across the steppe had managed just to talk their bikes’ way in the carriages without opening their wallets, this of course was not our lucky day. I guess we just had to grow up and accept that most of the things we imagine in our heads will not actually happen and after saying “we will take the bikes to cargo check in fairly” and bargaining as much as we dared, not to irritate the heated bribemaster too much, we managed to reduce the amount almost by half and ended up paying some 50 EUR (which for a long term traveller seems like a small fortune), the BossMan would then allow Mongoose, Iron Horse and Unicorn to enter the car. We knew we were not in Russia, storming through Siberia, however, we childishly hoped to witness some exciting Trans-Siberianlike events happening during the 70 hours we would spend on the train or at least old men telling interesting stories by a cup of tea and vodka in the restaurant car, there was no such thing. The excitement seemed to have been left on the platform together with the BossMans fancy uniform which he changed for something of a more casual attire as soon as the train was on the move. The time seemed to drag while we were moving, with endless steppe and unchanging landscape and only occasional silhouette of a camel outside the window. Indeed, the villages we passed were not more than a few houses around a train station, or so it seemed and when the terrain started to change for the more exciting, it was already the last night of our journey and too dark outside to see much, but when at last, early on the 3rd morning, we rolled in Almaty-2 train station, the time seemed to have passed rather quickly, but we all felt the urge to get out for a little nonetheless. 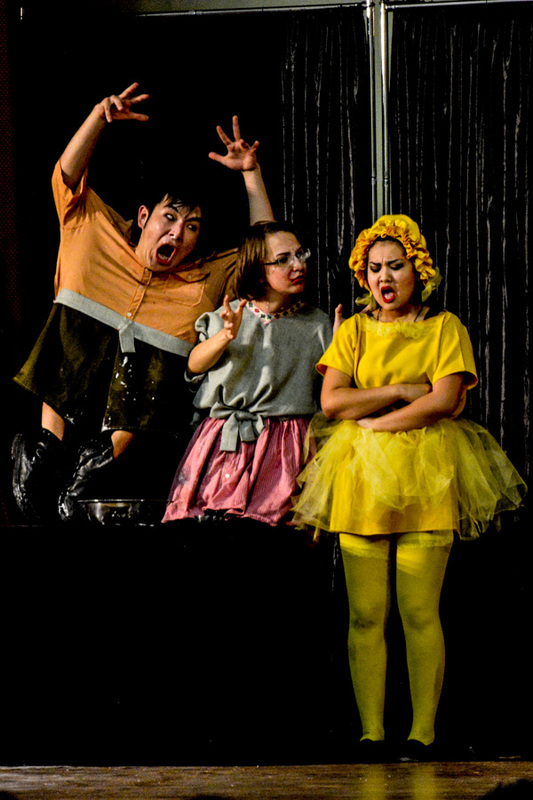 One reason why we were eager to get to Almaty ASAP was to meet with a new friend of ours (we first met on the New Year’s Eve in Tbilisi) – Duman, before he sets on a tour around Central Asia with an amateur theatre troop. And while we were researching the possibility of acquiring a Chinese visa in Almaty, Duman invited us to go along to KELTs (Kazakhstan English Language Theatre) rehearsals, where we met his team and really got to know some amazing people, truly quite dedicated to putting on the best performance they could. We also went to their first performance and (amateur or not) it was truly great and the almost full auditorium was laughing in mirth a lot of the time. A day after an extended beer-pong house party across the city, with some of the people we met in Almaty, after the arrival of police, Duman and Ivars ended up having a movielike experience – trying to flush down the toilet a chunk of Cannabis Sativa the size of a soap bar, which kept on resisting the principle of Archimedes. I was not there, so I cannot truly remember how the tale went when it was first told, so you might have to ask Ivars for more details if the curiosity bug still eats you. And maybe it was this new experience or maybe it was just that we were still in the arms of a post-soviet world, or maybe because it was time to make some new passport pictures for our Chinese visas, but soon after, Ivars and Dainis gave in to the urge for a long discussed extreme makeover. As for many travellers (and there are actually a huge number of them, with bicycles or not) caravanistan.com was also one of our main sources for gathering information about visa applications, routes, ferry information etc. in Central Asia. 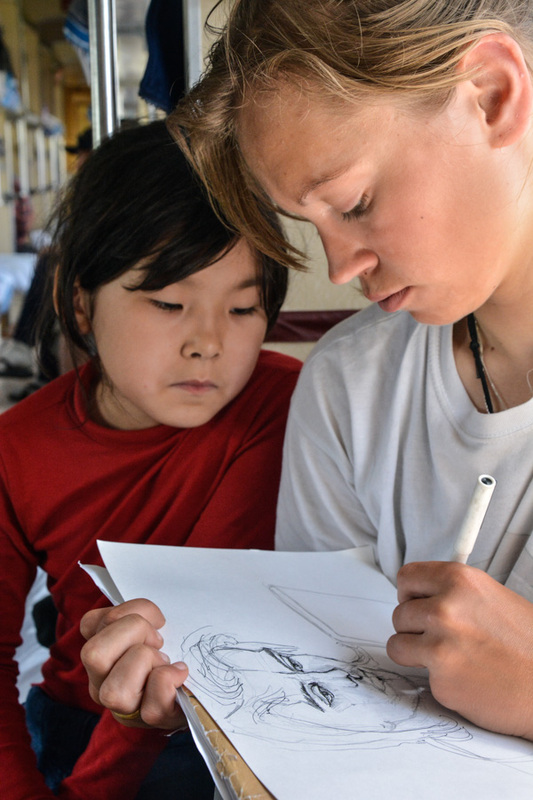 Turned out that for once, the Travel Gods were really with us and through people’s comments on forums we got an invaluable phone number of a translator/advocate called Sjerik, for we dreaded the long queues of the Chinese consulate in Almaty and knew we needed some help. At first, it seemed we would have to pay quite a large sum of money for the invaluable services of our newfound fixer, however, after telling Sjerik our story, he agreed to help us for almost nothing. Thus the initial price of 130 USD decreased quite handsomely, we have promised not to disclose the full amount of Sjeriks generosity in numbers (for our fixer still has a business to run, you see) but I can just say with the new price we could have attempted to go to China twice and more! Turned out, Sjerik really was our saviour, he organized our non-existent flights and hotel reservations in China for the necessary amount of time and after receiving those some 4 days later went with us to the consulate, where he seemed to know some secret pass-words and thus the neverending queues of people opened up in front of us and in about a week more we had our 30 day Chinese visas in our passports. This was beginning of summer 2015, how it is now, I hear even Sjerik might not be able to help, but things change all the time and you can always check Caravanistan for updates, for there you will definitely find someone far more informed in the subject than me and I hear you can find the contacts that might help on the first page these days. 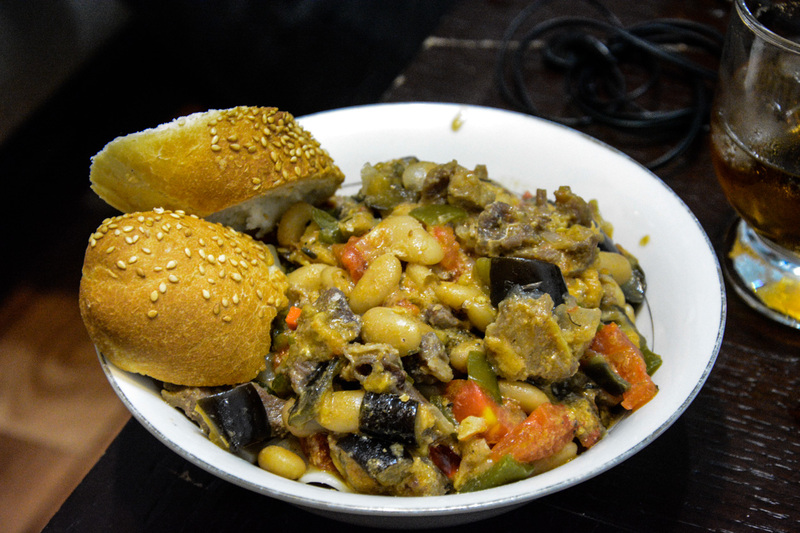 During the time we were waiting for our visas to be processed, we wished Duman Goodluck! on his tour and said Goodbye for now!, for we felt we should meet again one day. 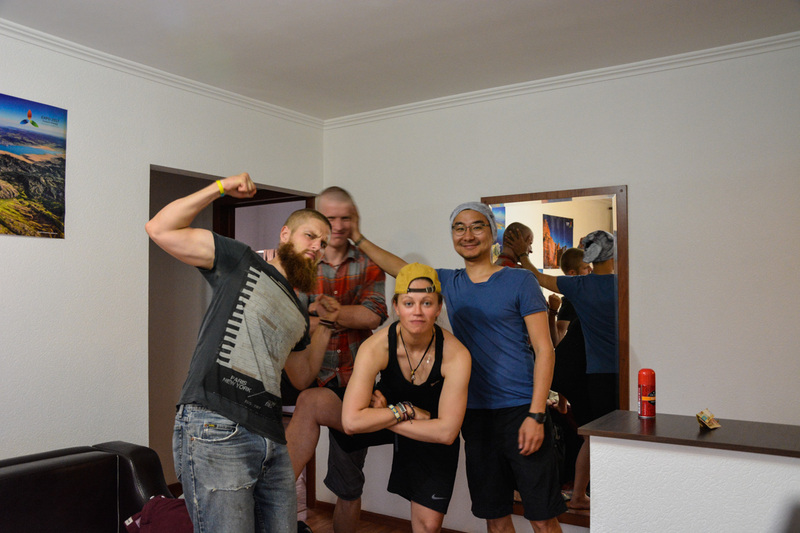 For the rest of our time in Almaty we stayed with Alina and her boyfriend. Here I found out that our hosts may well have a similar sense of humor as I, thus we watched “What we do in the shadows” once more. 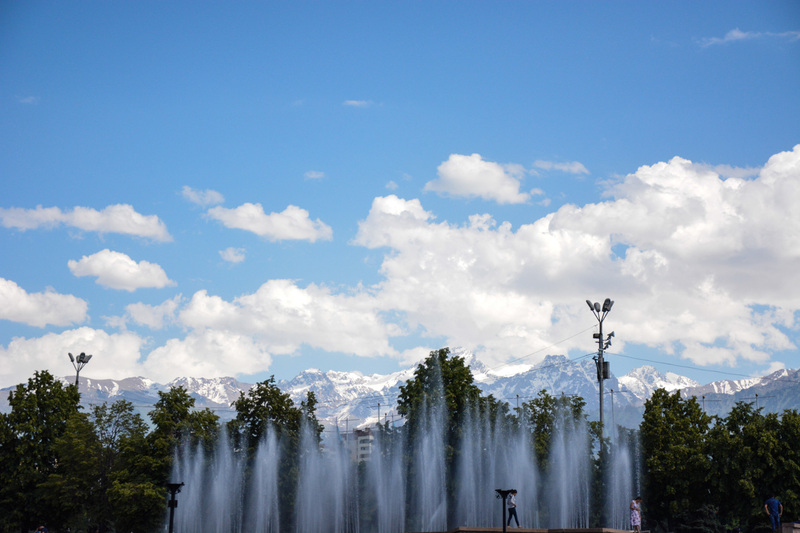 What little sightseeing we did in Almaty was mainly leisurely wandering about or hunting for the best bike shops in town (in Ivars case – also geocaching, of course), but if you have a pocketful of sunshine (a.k.a. 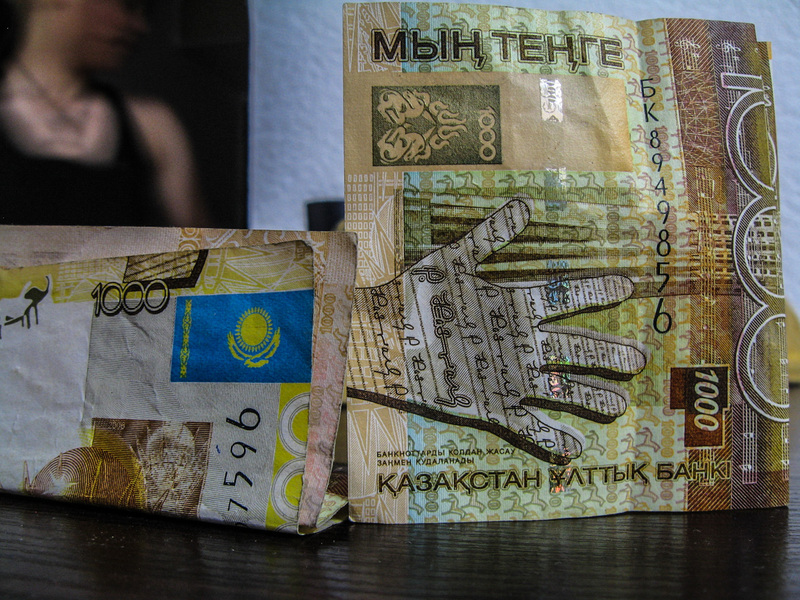 full wallet) then I would suggest Almaty as a place with a lot of trendy bars, restaurants and cafés. Whichever way it is, you can wander about the streets with pockets full of various apples (the biggest variety I have seen), since Almaty is the birth place of one of the most cultivated fruits in the world – apple and the original name “Alma-Ata” from Kazakh translates as “Father of apples”. I may only add that on our last day in the Father of Apples City we went to a folk music festival called “The Spirit of Tengri” and it was a truly great experience, with artists from Mongolia, Georgia, Turkey, (also Kazakhstan of course) and more. I felt it was a great and somewhat fitting way to say goodbye to the city and head for the mountains (Alina told me that there is a mountain like that, in fact the peak is on the tri-border of Kazakhstan/Kyrgyzstan/China called Khan Tengri, however I think the festival took the name since it is one of the chief deities in old Mongolic folklore and not because of the mountain, but you never know). 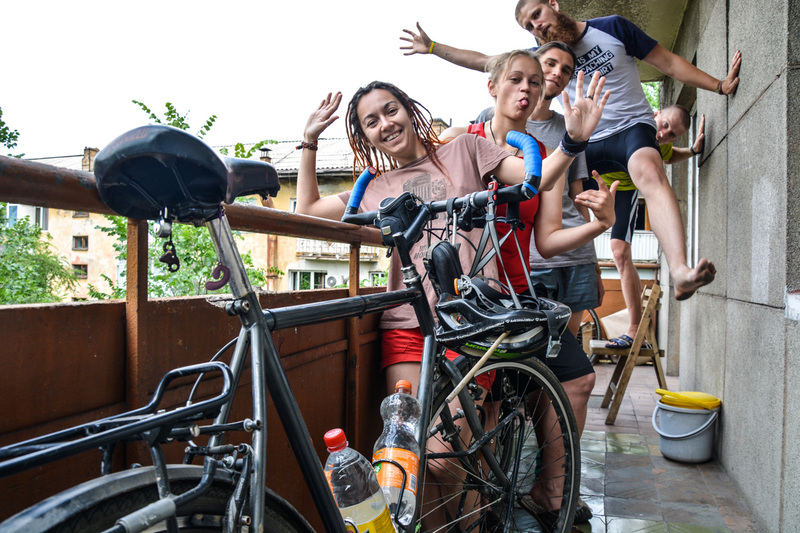 We were eager to start cycling again, so eager, in fact, that we made a silly video about the “reasons why NOT to go on a bike trip”. We took the PechaKucha style of presentation after being a part of the weekly event at Raketa Bar (РАКЕТА Бар & Гриль). All this time we had also planned to turn into Kyrgyzstan, since the lure of the mountains seemed far too big for us to resist, however a couple of days before leaving Almaty, we decided to leave Kyrgyzstan for another trip, along with most of the missed out countries of Central Asia. There are a few reasons for this (or are they simply excuses? ): No.1- We had been on the road by this point for 9 months and felt like the time was pressing, our wallets also seemed to think so No.2 – the border crossing between Kyrgyzstan and China is no fairy tale to say the least No.3 – Latvia does not have a visa-free regime with Kazakhstan and we could not just come back if we decided to. We were however not ready to leave the Land of Kazakhs without actually experiencing some of the more untouched and wild landscape where the famous nomadic tribes used to wander (that sounds far too poetic – in reality, we just wanted to see some grand, untouched mountains before entering the buzz of China). So we planned a little detour on our way from Almaty to Kazakh/Chinese border. 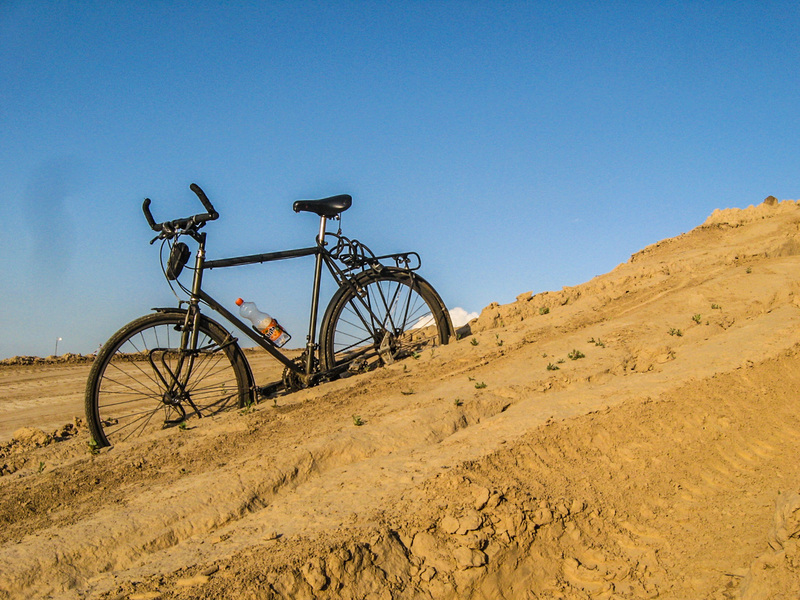 The plan was to cycle trough the Ile-Alatau National Park. 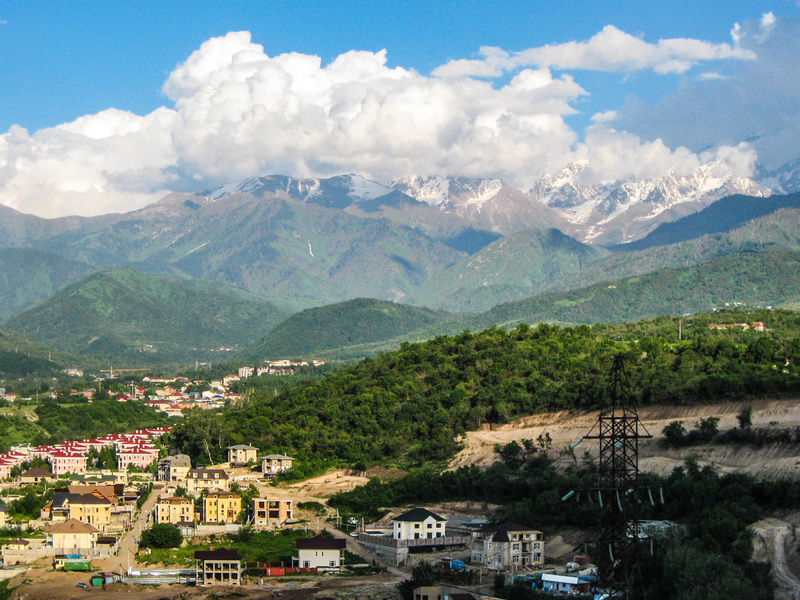 Situated in the mountains south of Almaty between Gorge Turgen in the east and Chemlogan River in the west it is famous for the stunningly beautiful scenery and wildlife. As with most of our plans (it could hardly be called a plan since we didn’t plan almost anything), something was about to go wrong.